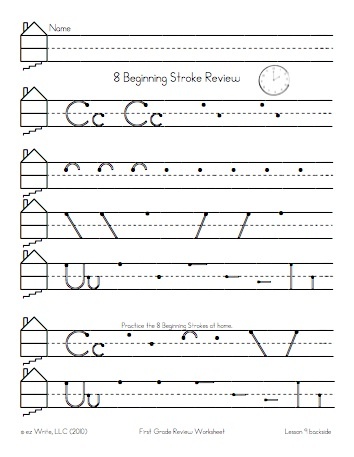 ✓Instruction in First Grade begins with a quick review of the 8 Beginning Strokes. ✓Numbers 1-9 are reviewed in stroke groupings and numbers 10-20 have activities to check students understanding of one to one correspondence. 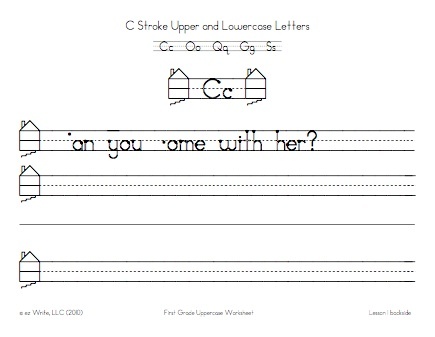 ✓Lowercase and Uppercase worksheets present the alphabet in stroke groupings which helps students learn proper formation and avoid reversals. 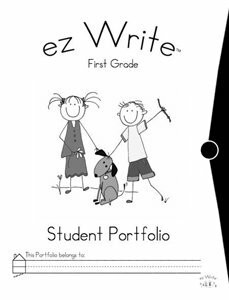 ✓First Grade students begin using ez Write Portfolios. They are designed as formative assessments to record and monitor creative writing, sentence structure, letter formation and writing speed. 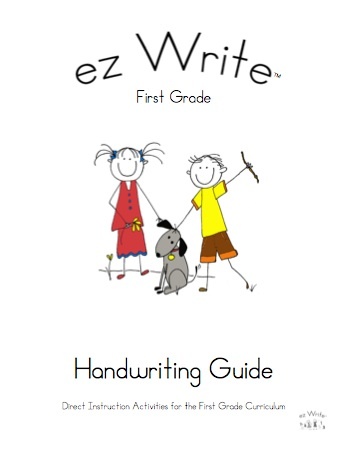 If your students have been introduced to ez Write in Kindergarten, the transition to First Grade should be easy. Begin the school year with a review of the 8 Beginning Strokes by doing the nine Review Lessons. If your students are new to ez Write, they have not had the benefit of learning the 8 Beginning Strokes to “Muscle Memory” in Kindergarten. It will be important for you to spend some extra time at the beginning of the school year to teach the 8 Beginning Strokes to your students because the strokes are the foundation of this program. Start the year by presenting the Stroke Review worksheets. Most students are able to learn the strokes quickly, but it is very important that they learn them to “Muscle Memory,” which means they are able to write them from memory. You may want to do a lesson one day and the backside the next day since your students are new to learning the strokes. This may feel like a very slow start, but you will see the benefits soon when your students begin to do the worksheets. 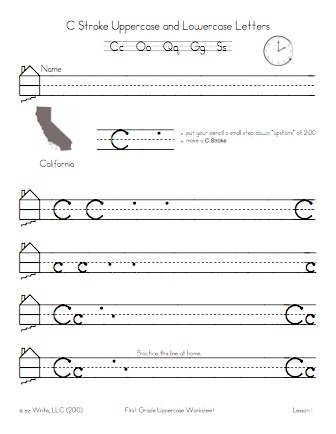 The Materials to Send Home File on the Teacher Resource CD contains ez Write Simplified Instructions to use for a quick reference or to print and send home to help parents learn the ez Write language. 16 Number Lessons: Numbers 1-10 are quickly review by the Beginning Strokes used to make them. 2 and 3 start with a Rainbow Curve, 4 and 5 begin with a Short Line Down, 6,8.9 and 0 begin with a C Stroke, Finally ez 7 begins with an ez Across line. 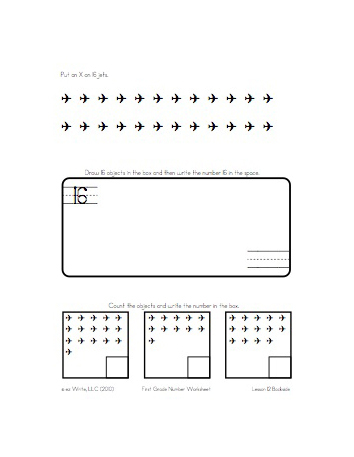 Numbers 10 – 20 are reviewedwith application activities to check that students have one to one correspondence (number 16 front and backside worksheet shown above). 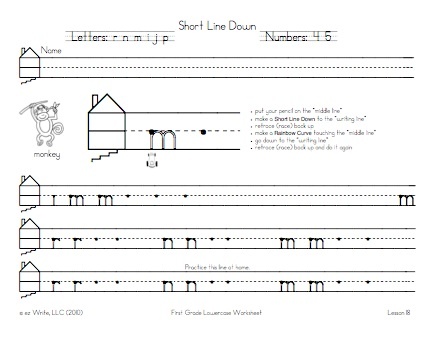 32 Lowercase Lessons: The letter of the day is practiced along with a review of the other letters learned using the same stroke. 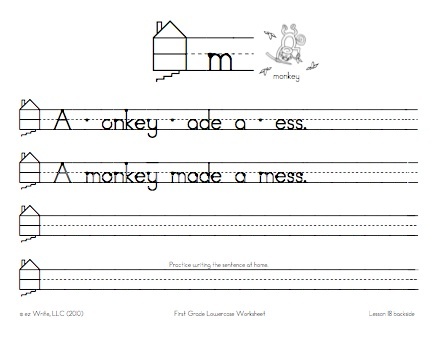 Teachers report that students enjoy hearing the sentence on the backside of the worksheet read without the letter of the day, “A onkey ade a ess.” This also helps students hear how important a letter sound is.